Few things bring a parent more joy than seeing their child find fulfillment and happiness in doing the activities they love. This is especially true for parents of students with special needs. On one very special Christmas Day, one family experienced this intense joy as they watched their son with autism open up and connect with his entire family for the first time through the power of music. Sammy was a 14-year-old student with autism who was so challenged by his anxiety, fear, and behavioral outbursts, that he could not enter through doorways without extreme unease and discomfort. This was not only true for his own classroom door at school, but also in the group recreation room where his class gathered for school-wide music and dance events. The ACCEL school that Sammy attended created a recording studio to help its students have valuable and unique experiences with music. They had plans to create an album, ACCEL-Beyond What You See, featuring the music their students performed and recorded. Sammy’s teacher approached him and proposed the idea for him to sing his favorite song, “The Hokey Pokey,” and record it for the album. Sammy was very excited about the chance to sing and record his song, but he still had an enormous challenge ahead to overcome his fears and anxieties in order to be able to do it. Staff members and teachers were understandably apprehensive that Sammy would not be able to enter the small recording studio space to record his featured song. Knowing what a calming effect music had on Sammy, his teacher would play the guitar and sing with him as they walked from their classroom to the recording studio in another part of the building. After much patience and practice and many visits to the exterior of the recording studio, Sammy was finally willing to step over the threshold into the small room. This was a huge step for Sammy—literally! Sammy eventually became comfortable enough to record his favorite song in the studio, fully engaged in singing without any anxiety or challenging behaviors. The song was recorded and added to the album, and his song was a hit with the staff and an incredible source of pride for his family. Sammy’s mother later relayed how much the experience and the resulting album impacted their family. On Christmas Day, the family gathered at their home to celebrate Christmas and listen to the ACCEL album. As usual, Sammy’s anxiety initially kept him in his bedroom away from the group. But, after a few songs, Sammy’s “Hokey Pokey” song began to play. Sammy immediately rushed out of his bedroom in front of his entire family and began to sing and dance to the “Hokey Pokey” song. The whole family immediately jumped up and began dancing and singing with Sammy. By the end of the song, every family member was joyfully crying, ecstatic that Sammy was truly spending Christmas with his family. His mother marveled that this was the first time Sammy had ever participated during a large family gathering! In fact, she said that the CD project was the best thing that Sammy had ever done in his life! Not only had the project motivated Sammy to overcome significant anxiety and fear to make the recording, but the resulting album also allowed Sammy to connect with his family and enhance the family’s love, enabling real bonding with him. For children and students with special needs, music can be a powerful motivator, a source of joy, and a way to increase connection and social interaction. Music is universally powerful for people of all ages and backgrounds. It has the ability to provoke emotion, help us remember events and moments in our lives, and connect us together. Music has the capacity to touch every child, including those with special needs, and it can be an incredible tool in the education and socialization of children with all kinds of disabilities. The interactive characteristic of music makes it a fun and extremely effective teaching tool. Countless studies have demonstrated that this is particularly true for children with Autism Spectrum Disorder (ASD) and other special needs like cerebral palsy, childhood apraxia of speech (CAS), and those with learning disabilities. Music education and exposure have also had a positive impact on children suffering from depression, ADHD, and anxiety. In many cases, music allows students with certain disabilities to learn in ways they never have before. Not only can music stimulate learning and encourage responsiveness, empathy, and communication in those with special needs, as was the case with Sammy, it also promotes feelings of empowerment and connectedness that can be truly transformative. Unlike traditional instruction which may only be auditory or visual in some cases, music provides a way to use more of a child’s senses in the experience. For example, when a child hits a drum, their tactile system is involved as they hold the mallet in their hand and feel the wood against their palm. Their muscles are engaged as they move their wrist, arm, and shoulder to strike the drum. Their auditory system takes part as they listen to the sound the drum makes and how it relates to the other sounds or instruments in the room. Visually, their eyes track the motion of the mallet hitting the drum to the beat of the music. It is a whole-body experience. For children who learn in non-traditional ways, the more senses you can involve in the learning process, the better. Additionally, kinesthetic movement can be an effective tool in learning for children or students with special needs. As Hans Christian Anderson once noted, “Where words fail, music speaks.” For many children with special needs, words present an enormous challenge. Some students have difficulty expressing themselves and communicating their needs or feelings, while others have problems understanding and processing words as they come in, either written or spoken. Music can eliminate this barrier altogether because it allows connection and communication without words. For many special needs’ students, it significantly diminishes the frustration of turning their inner feelings into verbal expression—which one music therapist compared to the helpless and frustrating experience of trying to communicate in a foreign country using a foreign language. He noted the freedom and the relief music offers these students by allowing them to say exactly how they feel without any words at all. From the very earliest studies done on children with Autism, the musical abilities and inclinations of these children were noted. Since then, researchers have proven that while language and social abilities might show impairment, individuals with ASD process music in very similar ways as those who do not have autism. Even more importantly, other studies have determined that many individuals with ASD show a preference for musical over verbal stimuli. Individuals with ASD also showed superior pitch abilities to their neurotypical counterparts and performed better in memory tests of pitch and picture pairs. In other words, in terms of musical interest and ability, those with autism have the advantage over individuals without it. Using this natural advantage and inclination is a logical way to improve their learning experiences. Additionally, music is processed in many regions of the brain simultaneously. When we look at the neuroscience of creating music, the sensory cortex, auditory cortex, hippocampus, visual cortex, cerebellum, amygdala, prefrontal cortex, and motor cortex are all firing at once. Involving so many areas of the brain gives many advantages in learning, especially for children who may have a disability or brain injury limited to specific neurologic areas. When faced with a difficult task, like cleaning the house or going on a long run, lots of people like to turn on some music to help motivate them. Athletes listen to upbeat music before they play or compete to increase their energy and drive. In much the same way, music can be a powerful motivator for students with special needs. Sammy was calmed by the guitar music and motivated by the opportunity the recording studio provided. Through this motivation he was able to do something he found traditionally uncomfortable. Music can have positive behavioral impacts and persuade reluctant students to try new things, push past their comfort zones, and develop new skills. As previously mentioned, music has also proven to have a behavioral impact for students with special needs, improving appropriate behavior and interpersonal interaction, therefore creating a better learning environment altogether. It has also been shown to relax muscles and provide positive distraction from anxiety, discomfort, and pain. Music and music therapy programs can make a significant difference in helping students with special needs to meet the educational goals set by their Individualized Education Program (IEP). Many of our best memories are connected with specific songs or musical experiences. The brain releases oxytocin, which is the hormone that promotes connection and bonding when listening to or making music. For children who struggle to make emotional and social connections with others, music can provide a tool to help make these important connections. Every child is different and will have their own preferences and musical tastes, but exploring what makes your child respond positively can help improve relationships and enhance bonding. Sammy’s important family connections were directly facilitated through music, and this can be the case for many children with special needs. At ACCEL we use every resource available to help our students grow, develop and learn. Children with special needs all have unique challenges. Our goal is always to reach each child and help them learn in the way that works best for them. Using music as part of our curricula is just one example. 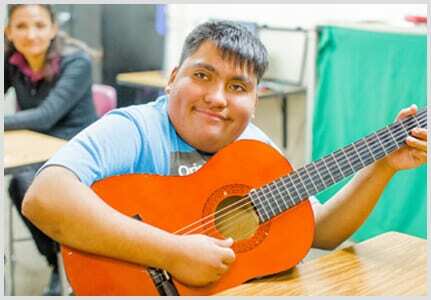 For many students with special needs, music is a fulfilling form of expression and we use it as a tool to help them develop confidence, improve their learning, overcome behavioral and neurological challenges, and cultivate a variety of life skills. As we’ve demonstrated, through music, Sammy was able to share his talents, express his feelings, overcome some significant fears and anxieties, and connect with his family. These are all outcomes that had not been previously achieved through other methods. These positive results were achieved by utilizing music as an effective motivator and learning tool. It made a huge difference in Sammy’s life and in his family’s life. That is exactly what our programs are designed to do. Everything we do at ACCEL is aimed at helping our students find joy and dignity and self-confidence as they learn and grow and live with their disability. At ACCEL we incorporate music into many portions of our student’s everyday learning experiences. We use singing, movement, and dance regularly to encourage multi-sensory and whole-body learning. We use songs in the morning routine to energize the students and get them excited about learning each day. 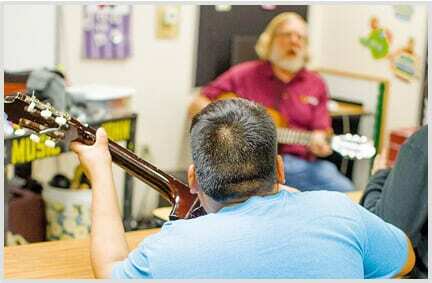 Each of our campuses has a dedicated music therapist. Rather than providing entertainment or motivation, music therapy has defined therapeutic objectives and purposes. Special emphasis is given to imitation and developing and strengthening gross and fine motor movements. Our music therapists spend time in each classroom every week and employ singing and instrumentation to engage, involve, and teach the students. Our music therapists use a wide variety of unique instruments that bring great enjoyment to students of all skill, disability, and developmental levels. A dynamic recording studio has been one of ACCEL’s highlight programs and was featured at the 2010 National Council for Exceptional Children Conference. Although we are proud that it received national attention, we are even more proud of the transformation we see in our students, like Sammy, as they have used this unique and valuable resource. The idea for the recording studio came from Bradley Reed when he was a teacher at ACCEL. Brad now works as part of the ACCEL administrative team as a Senior Mentor Teacher, but in 2006 he was teaching a high school classroom of moderate to severe intellectual disability students. At the time, his class was working on pre-vocational and vocational goals. Brad noticed that some of his students were feeling burned out and unenthusiastic about the tasks they were providing the students as part of their vocational curriculum. 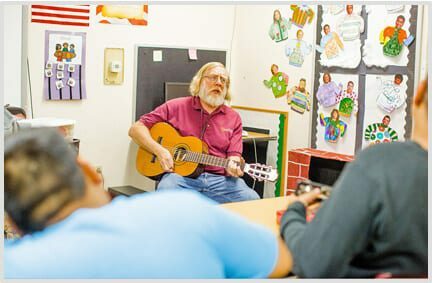 Brad had a musical background and began to incorporate music into the curriculum with singing and instruments and he found that his students really responded to it. He also observed many students in other classrooms with similar musical abilities and inclinations. He thought about what could help each of these students. Brad had a recording studio background, and so he wrote a proposal to the ACCEL leadership team, suggesting that they start a recording studio at the school as a way to engage the students as well as improve language and literacy skills and increase social skills. For Brad and the rest of the team at ACCEL, the potential benefits for students who would use the new recording studio were numerous: increased focus and attention, improving gross and fine motor skills, memory boosting, opportunities for the students to make requests and invitations, reduce anxiety and fear, progression in learning how to take turns, make eye contact, and understand personal space. Additionally, in the creation and performance of music, the self-confidence and self-esteem of the students would also be enlarged and strengthened. The ACCEL leadership team funded the project and the recording studio was born. They turned a tiny room on the ACCEL Metro campus into the studio, acquired a computer and all the studio equipment they needed. The idea was that students could come into the studio and record the songs that they had personally selected and then learned. The students chose songs they really enjoyed and then learned and practiced the songs in the classroom, improving their literacy and memory skills in the process. There were many musicians on staff at ACCEL and they put together a band, played at dances on campus, and laid down instrumental tracks to accompany the students’ vocal recordings. Using tracks recorded by the band or purchased karaoke tracks, Brad was able to provide accompaniment for the students’ recordings. The students worked hard and acquired many skills along the way: they learned the songs, practiced using a microphone, spent time working in the studio itself to get used to hearing themselves in the monitors and utilizing the specialized equipment. For many students this took lots of visits and lots of practice. It was a lot to master and a lot to adjust to and it was so valuable for many students as they worked through the process. The program was a huge success! So much so, they decided to release an album that showcased the work of the students. This project involved the whole school. Some students were able to create the artwork for the album jacket, which gave them an opportunity to further develop fine motor, social, typing and literacy skills. For one song, “867-5309/Jenny,” the whole ACCEL staff got involved and recorded the chorus together. A student then sang and recorded the verses and Brad put it all together in one track on the album. It was a huge success! The program has produced three albums to date with plans for many more. Sammy and his family are just one among many that have been positively impacted by these albums. After the pilot program proved successful, the school was also able to incorporate literacy and language arts curriculum into the studio work, by having the students write their own poetry as well as read poetry from other authors. The teachers and leaders at ACCEL developed a whole curriculum incorporating teaching strategies for the students to write and record their poetry. Much of it was very meaningful as they wrote about their families, the ACCEL staff, their girlfriends or boyfriends. The students not only recorded their poetry, but they personally chose music to play in the background of their readings. All of it—from the speed to the genre of music—was their decision and their creation. It’s important to remember that while the students are finding joy in making their music and poetry recordings, important learning, socialization, and development is happening simultaneously. Developing the skills of playing musical instruments, singing, improvising, composing, and listening. Acquiring and improving speech and language skills through repetition, language expression, verbalization, vocalization, articulation, rhythm, and breath control. Enhancing learning and focus through rhythmic movement, multi-sensory stimulation, and kinesthetic participation. Improving gross motor skills through coordination, mobility, strength, agility, balance and muscular relaxation. Strengthening fine motor skills and dexterity. Exercising creative expression, idea generation, as well as improving literacy and fine motor typing skills. Providing vocational opportunities through marketing the CD’s to peers, parents, caregivers, teachers/staff, bus drivers, and the surrounding community. Fostering a sense of pride and ownership in their hard work. Practicing social skills like turn taking, allowing for personal space, following directions, and listening to others. Boosting self-esteem and confidence through participation. Because the studio provides so many exciting and positive benefits for ACCEL students, the school recently applied for and received a grant to continue the recording studio program. A new space has been set up with all-new, updated, state-of-the-art equipment. A skilled staff member has taken on the role as the recording engineer, and the school already has a dozen students working on songs and learning lyrics so they can record their songs. The next album will feature 10-20 students and a song that will again include the staff singing the chorus. There is lots of excitement building as the new studio starts up. The ACCEL recording studio is open to any student who is interested. We incorporate every student who wants to participate, no matter the severity or limitations of their disability. We have severe and profound students, who are non-verbal or have minimal gross motor skills, involved as well. One student shakes a tambourine while another shakes a bell. With today’s technology we can record their individual instrument tracks in the classroom and then add them to the complete song track in the studio. Throughout the learning and recording process, we always go at the student’s personal pace. We provide practice microphones in the classrooms so the students can get used to singing or performing while something is placed in the middle of their face. We visit the studio and let the students explore it until they get comfortable. We give our students lots of practice during multiple sessions with the recording equipment itself. There are so many different kinds of opportunities for learning and development in the studio. For example, with the new studio opening, we are also taking the opportunity to track and record the progress of our students in regard to specific social skills. In this case, one of the things we are working on is accommodating personal space. The small recording studio provides the perfect place to practice this important skill. Teachers will record baseline data on this social skill prior to the recording studio experience and then do an assessment and record post-data results, to see if the social skill has improved through the experience. 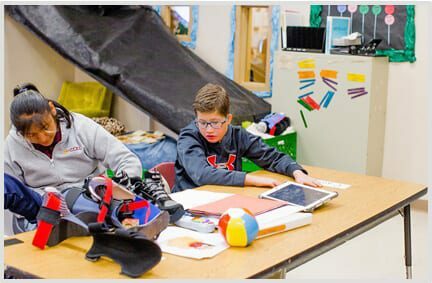 In addition to providing a stimulating and effective curriculum for each of our students, one of our primary goals at ACCEL is to create opportunities for our students to gain independence, confidence, and dignity through their accomplishments. Our music program, therapy sessions, and recording studio are all designed with this in mind. Sammy’s experience at ACCEL was very special for him and his family, but it was not unique. Many of our students have had incredibly fulfilling and transformative experiences through our music program and our campus recording studio. At ACCEL, we are grateful to be a part of creating opportunities like these for all of our special students and their families. If you want these programs to be part of your child’s learning experience, contact us today for enrollment details.